This North Myrtle Beach resort is conveniently located in the Cherry Grove area, which is famous for the fishing pier and saltwater channels that flow into the residential neighborhoods. 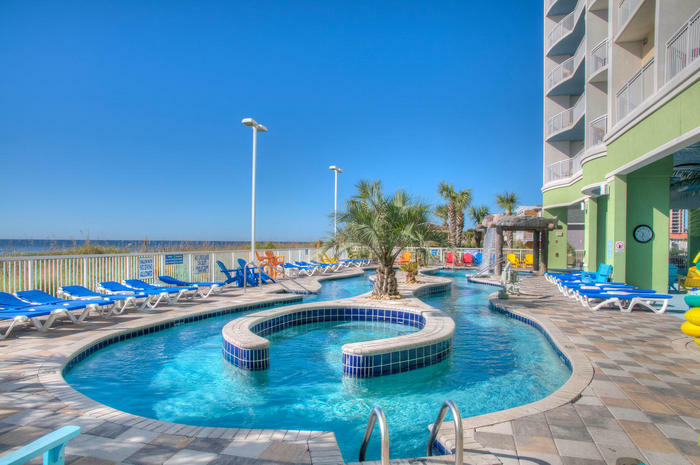 This beautiful resort has an oceanfront pool deck, easy access to gorgeous white sandy beaches and delightfully decorated North Myrtle Beach condominiums. This oceanfront resort has condominium rentals that would make a wonderfully romantic getaway for two and also vacation units that are designed to accommodate families. The oceanfront North Myrtle Beach resort of Towers on the Grove goes all the way to the 20th floor. There are North Myrtle Beach vacation rentals in this resort that are directly on the oceanfront, others that have side views of the Atlantic Ocean and some that have balconies which face the salt marsh. Every North Myrtle Beach rental has a balcony. The hallway at Towers on the Grove is enclosed and a bank of elevators is in the middle of this hallway. Reserve a spacious penthouse in this North Myrtle Beach resort for your North Myrtle Beach vacation. The luxurious three-bedroom, three-bath North Myrtle Beach condo rental sleeps 10 people. Filled with contemporary furniture, ceiling fans and amazing, jaw-dropping views, the luxury penthouse vacation rentals at Towers on the Grove are remarkable. Throughout these large North Myrtle Beach vacation rentals there are windows that extend from the floor all the way to the ceiling. These windows appear in the living room, dining area and all three bedrooms of the North Myrtle Beach vacation penthouses at Towers on the Grove. Everywhere you walk throughout this fantastic North Myrtle Beach rental you can see the Atlantic Ocean and white sandy beaches. There are a number of one-bedroom floor plans at Towers on the Grove so you can choose the one that suits you best. From a one-bedroom, one-bath North Myrtle Beach condo that is romantic and well suited for two people to a one-bedroom, two-bath North Myrtle Beach rental that accommodates a family of six. You can have an innovatively designed efficiency unit in Towers on the Grove where the bedroom boasts a balcony and the small kitchen has a dishwasher. Elliott Beach Rentals is not affiliated with onsite management or the HOA of Towers On The Grove.